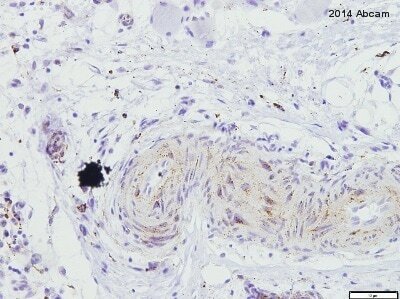 IHC on human tissues which we tested (such as testis, pancreas and stomach) showed non-specific staining. 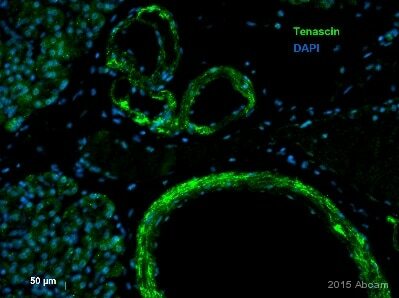 We don’t recommend this antibody for IHC on human tissues. Synthetic peptide within Human Tenascin C aa 2150-2250. The exact sequence is proprietary. 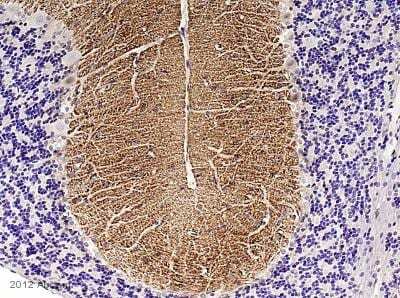 IHC-Fr: Mouse E14 spinal cord and cerebellar cortex tissue; Rat cerebellar cortex tissue. IHC-P: Rat cerebellar cortex tissue; Mouse E14 spinal cord and cerebellar cortex tissue. WB: U87-MG cell lysate; Postnatal mouse cerebellum lysate; Postnatal rat brain lysate; Human fetal brain lysate. Our Abpromise guarantee covers the use of ab108930 in the following tested applications. WB 1/1000 - 1/10000. Predicted molecular weight: 241 kDa. Extracellular matrix protein implicated in guidance of migrating neurons as well as axons during development, synaptic plasticity as well as neuronal regeneration. Promotes neurite outgrowth from cortical neurons grown on a monolayer of astrocytes. Ligand for integrins alpha-8/beta-1, alpha-9/beta-1, alpha-V/beta-3 and alpha-V/beta-6. Contains 15 fibronectin type-III domains. Immunohistochemistry (Formalin/PFA-fixed paraffin-embedded sections) analysis of rat cerebellar cortex labeling Tenascin C with ab108930 at 1/500 dilution (0.854 μg/ml). Heat mediated antigen retrieval was performed using Tris/EDTA Buffer, pH 9 (ab93684). A ready to use Goat Anti-Rabbit IgG H&L (HRP) secondary antibody was used. Hematoxylin counterstain. Staining on the molecular layer of rat cerebellar cortex (PMID: 1372043) is observed. Immunohistochemistry (Frozen sections) analysis of mouse E14 spinal cord labeling Tenascin C with ab108930 at 1/100 dilution (4.27μg/ml). Tissue was fixed with 4% PFA and permeabilized with 0.2% TritonX-100. Antigen retrieval was performed using a heated citrate solution (10mM citrate PH 6.0 + 0.05% Tween-20). ab150077, an AlexaFluor® 488 Goat anti-Rabbit secondary antibody was used at 1/1000 (2 μg/ml). DAPI nuclear counterstain. Positive staining on mesenchymal condensations during chondrogenesis of mouse E14 embryo (PMID: 9822997; PMID: 19586317; PMID: 24778247) is observed. Liver is negative control (PMID: 1717349). The molecular weight observed is consistent with what has been described in the literature (PMID: 10462531). 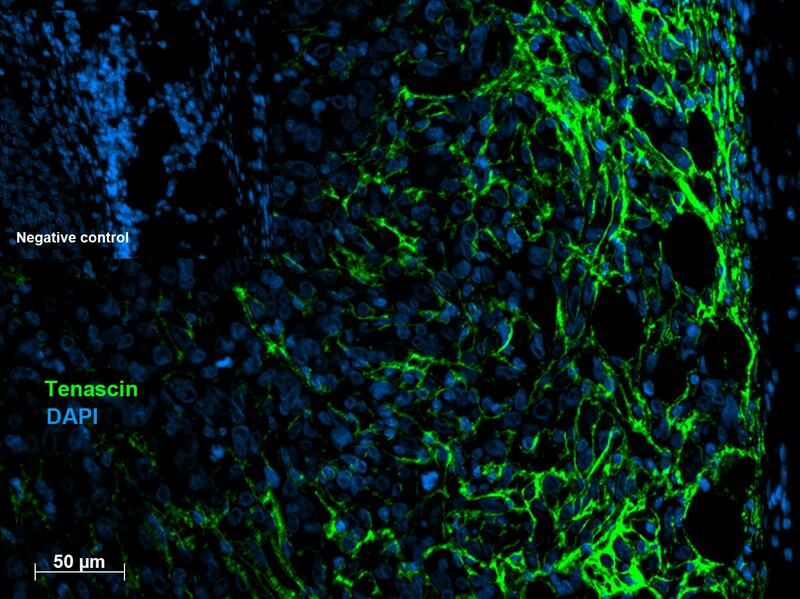 Immunohistochemistry (Formalin/PFA-fixed paraffin-embedded sections) analysis of mouse E14 spinal cord tissue sections labeling Tenascin C with ab108930 at 1/500 dilution (0.854 μg/ml). Heat mediated antigen retrieval was performed using Tris/EDTA buffer, pH 9 (ab93684). 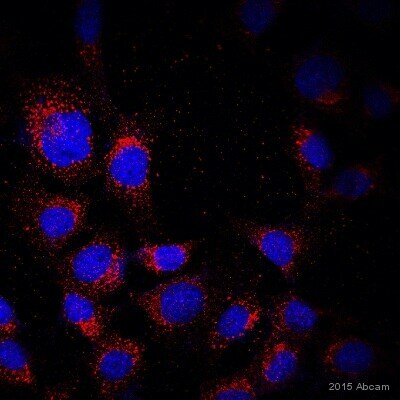 A ready to use Goat Anti-Rabbit IgG H&L (HRP) secondary antibody was used. Hematoxylin counterstain. Observed band size: 250 kDa why is the actual band size different from the predicted? The molecular weight observed is consistent with what has been described in the literature (PMID: 10462531). Immunohistochemistry (Frozen sections) analysis of rat cerebellar cortex labeling Tenascin C with ab108930 at 1/100 dilution (4.27μg/ml). Tissue was fixed with 4% PFA and permeabilized with 0.2% TritonX-100. Antigen retrieval was performed using a heated citrate solution (10mM citrate pH 6.0 + 0.05% Tween-20). ab150077, an AlexaFluor® 488 Goat anti-Rabbit secondary antibody was used at 1/1000 (2 μg/ml). DAPI nuclear counterstain. Positive staining on the molecular layer of rat cerebellar cortex (PMID: 1372043) is observed. Immunohistochemistry (Frozen sections) analysis of mouse E14 cerebellar cortex labeling Tenascin C with ab108930 at 1/100 dilution (4.27μg/ml). Tissue was fixed with 4% PFA and permeabilized with 0.2% TritonX-100. Antigen retrieval was performed using a heated citrate solution (10mM citrate pH 6.0 + 0.05% Tween-20). ab150077, an AlexaFluor® 488 Goat anti-Rabbit secondary antibody was used at 1/1000 (2 μg/ml). DAPI nuclear counterstain. 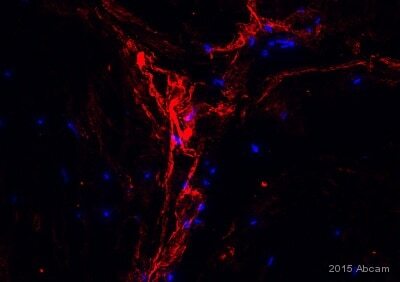 Positive staining on the molecular layer of mouse E14 cerebellar cortex (PMID: 1372043) is observed. Immunohistochemistry (Formalin/PFA-fixed paraffin-embedded sections) analysis of mouse cerebellar cortex labeling Tenascin C with ab108930 at 1/500 dilution (0.854 μg/ml). Heat mediated antigen retrieval was performed using Tris/EDTA buffer, pH 9 (ab93684). Hematoxylin was used to counterstain. 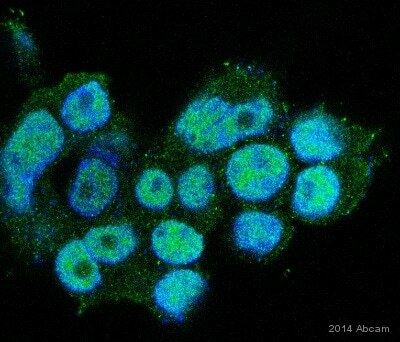 A ready to use Goat Anti-Rabbit IgG H&L (HRP) secondary antibody was used. 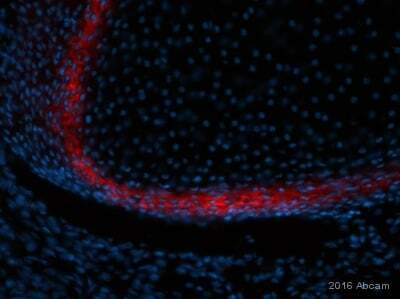 Staining on the molecular layer of mouse cerebellar cortex (PMID: 1372043) is observed. Publishing research using ab108930? Please let us know so that we can cite the reference in this datasheet.